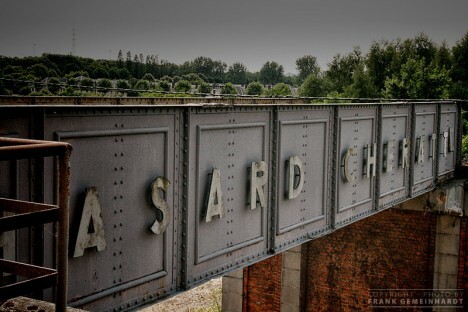 The abandoned Hasard de Cheratte coal mine in Visé, Belgium, operated from 1877 to 1977 and when it closed, 600 miners lost their jobs. 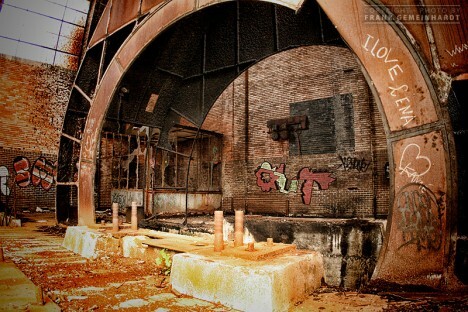 The site has been neglected since then and has become somewhat of a mecca for urban explorers. Kudos to Flickr user DueSiGrafie for snapping the awesome photo above on March 6th of 2014. 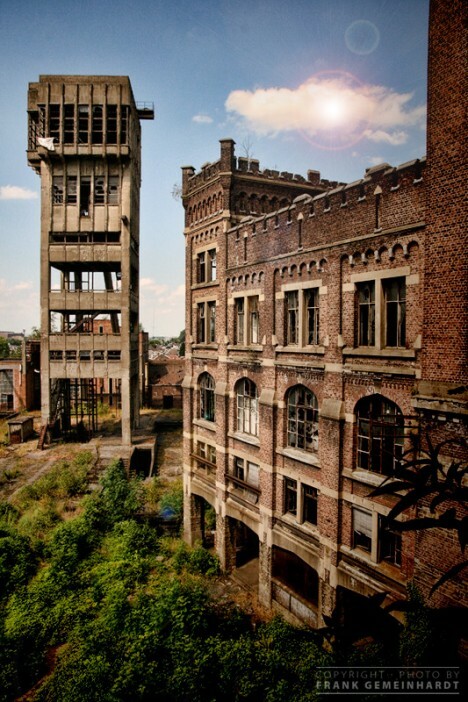 Infrastructure components were constructed over a period of many decades and the contrast between the castle-like buildings dating from the 19th century and the stark, reinforced concrete winding tower built in the 1920s is striking to say the least. 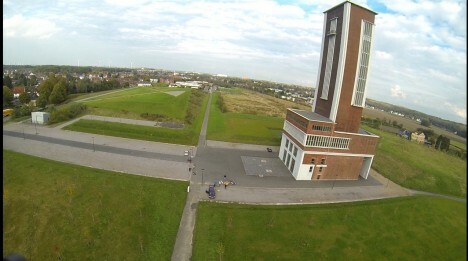 Flickr user Frank Gemeinhardt (gemeiny) visited the site in March of 2012. 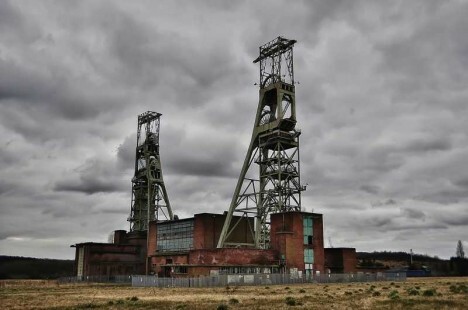 The Clipstone Colliery near Clipstone, Nottinghamshire, UK closed in 2003 and as its buildings have been Grade II listed, the site has languished for over a decade. 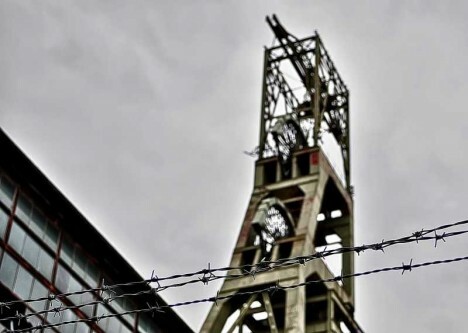 Simply listing a site doesn’t provide ironclad protection, however, and the Clipstone Colliery’s twin 200-ft (65m) tall “headstocks” have faced the threat of demolition a number of times since the mine closed. 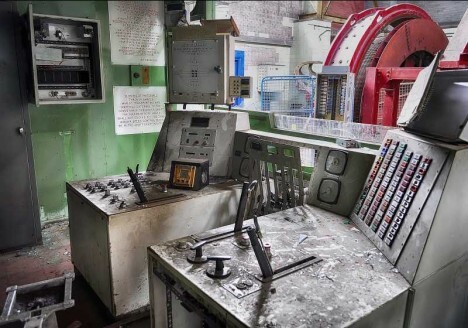 A tip o’ the cap to Flickr user Carl Hartley (Sonyess…..) who HDR-photodocumented the site inside and out in early 2013. 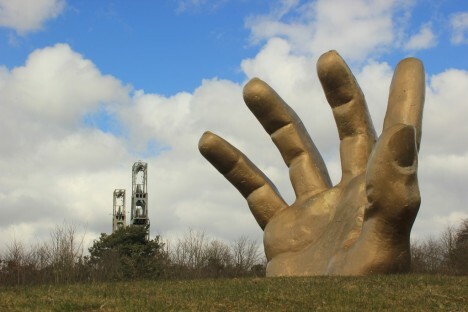 As for the enormous golden hand situated nearby… your guess is as good as ours. 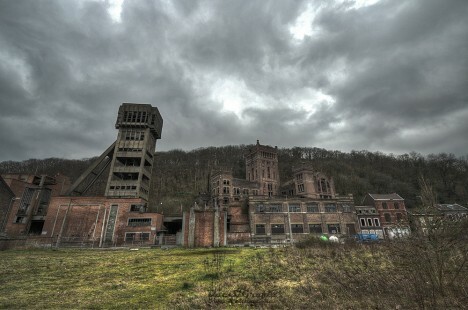 Designed by industrial architect Alfred Fischer, the 68-meter (just over 200 ft) tall winding tower at the former Königsborn III/IV coal mine in Bönen, Germany opened in 1929 and closed along with the rest of the mine in 1981. 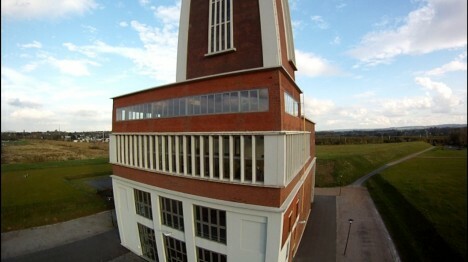 As the tower represents for many the area’s long and prosperous industrial heritage, it has been preserved, renovated and renamed the Community Foundation Winding Tower (Bürgerstiftung Förderturm, in German). 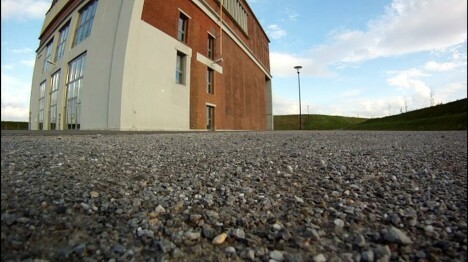 The accompanying series of images comes courtesy of Luftaufnahmen günstig.